You can spear-head the survival efforts of the looming zombie apocalypse when you face it with this wicked M48 Apocalypse survival spear! This mean spear measures in at a whopping 44 1/8” from end to end, featuring a razor-sharp 8” blade that is nearly half an inch thick! With a stainless steel blade this powerful, this spear was built for durability and strong use, even in the grueling conditions of the zombie apocalypse. 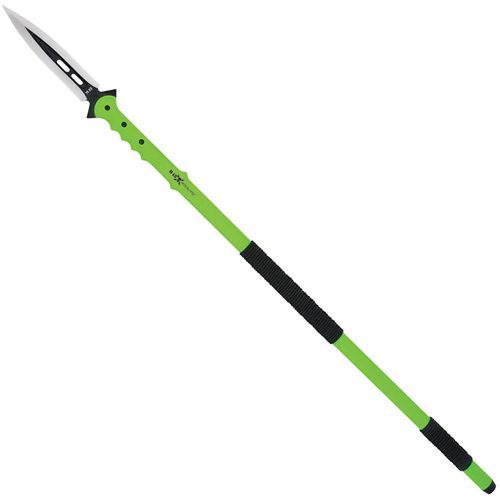 Practical applications abound with this massive spear, including uses such as breaching, prying, and impaling practically anything–zombies or otherwise! The handle is meticulously crafted of 30% fiberglass in the design of a cane and is nearly indestructible. Includes rubber sheath.